The other day I picked up a jar of roasted red bell peppers at the store and was wondering what to use it in when I thought about hummus. The hubby and I love the traditional hummus made with chickpeas, tahini, olive oil and a hint of garlic; another reason why we frequent Mediterranean restaurants, the first being for falafels. 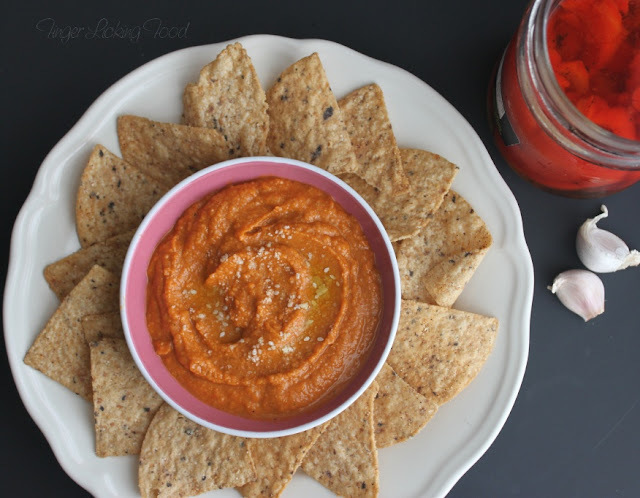 Roasted Red pepper hummus has the same ingredients with a few additions and the flavor of roasted bell pepper comes through nicely. I had jalapenos on hand hence threw them in, and the onions as well. Note: If you don’t want any heat from the jalapeno, remove the veins and seeds. 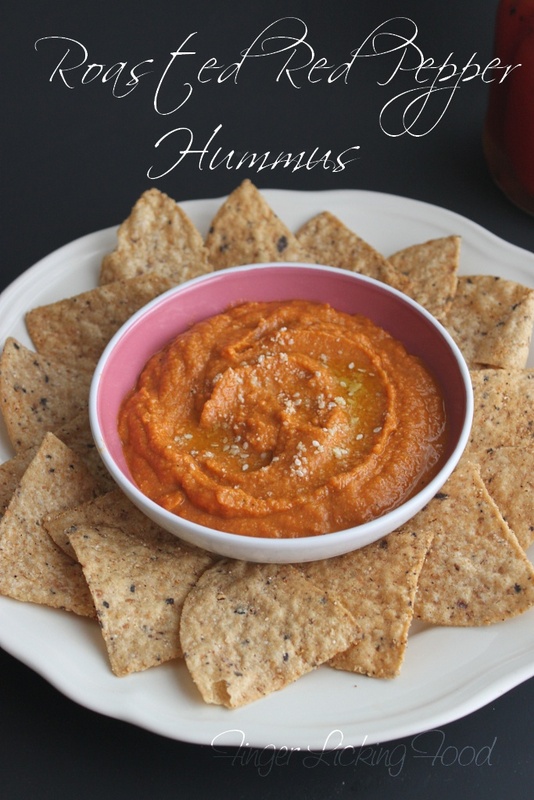 We like our hummus with a kick so I used the whole jalapeno, veins et al. Blend all ingredients together in a food processor until almost smooth. Check for salt and add more if required. Transfer to a bowl, top with a tablespoon of olive oil and a pinch of the ground sesame seeds. 1. 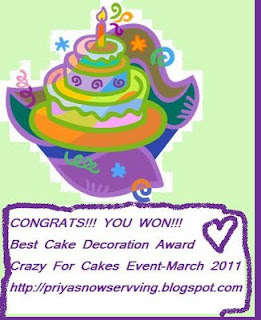 Thank the person who gave you this award, follow their blog and link back to their blog in your post. 2. Tell 7 random facts about yourself. 3. Pass the award to as many bloggers as you like. I am a very organized person, all about lists and plans and everything in place well ahead of time. Cake decorating is very therapeutic and relaxing for me. I can decorate all day and still be ready to take on more. There is nothing that I am more passionate about. Roaches scare the hell out of me…. I’ll yell and scream and bring the roof down. I enjoy watching movies, romantic, comedy, family movies - except horror. I enjoy writing poetry - emotions, situations and nature are my top inspirations. 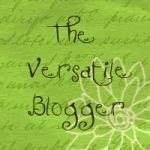 Nags of Edible Garden - has a flair for writing, her scrumptious food pics will have you drooling. Love her eye for detail in everything. Madhavi of Vegetarian Medley - who has excellent food presentation skills with unique recipes which will make you grab a fork alright! A great mom too. Shankari of Sacramento Spice - whose passion for cooking is in her way of imparting it to others. A wonderful person. 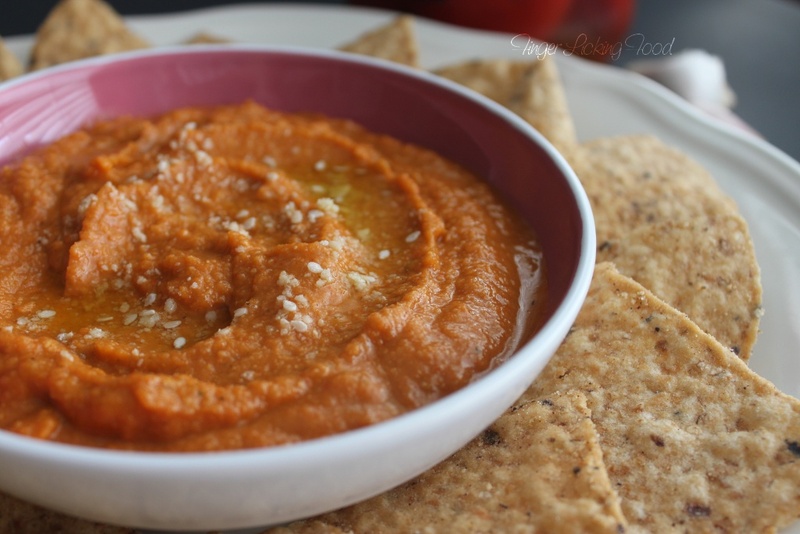 Feel like grabbing that whole bowl and enjoying with some tortilla chips rite now...congrats on ur awards..
Love the hummus dear, I have never tried hummus at home, but I guess I should.